We stopped by St. Petersburg on our way from Fort Myers to Orlando. 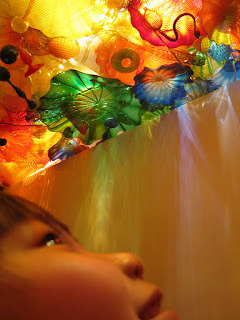 The weather turned wet during our stay there, so we decided to see something new and unique. 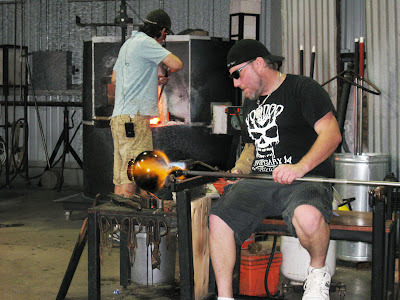 Not far from our hotel was a glass blowing demonstration and museum at the Morean Art Center, a community-focused organization that supports the visual arts through its galleries and studios. Morean Art Center (719 Central Avenue), a community-based art gallery and studio that exhibits both local and national artists and provides art courses to the community. 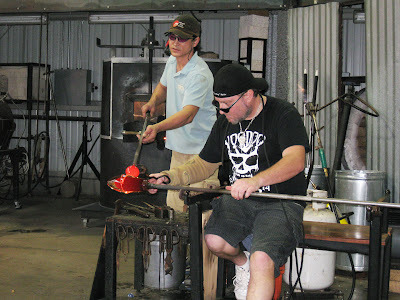 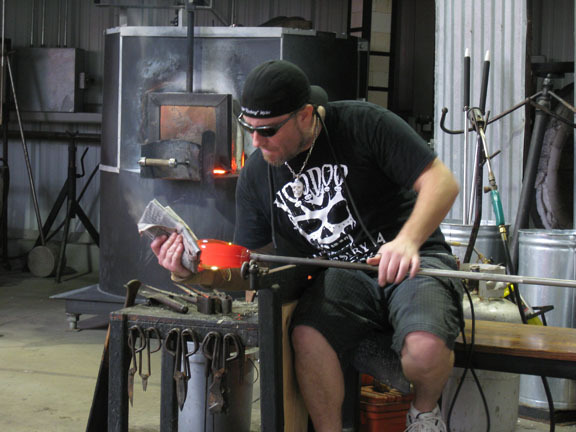 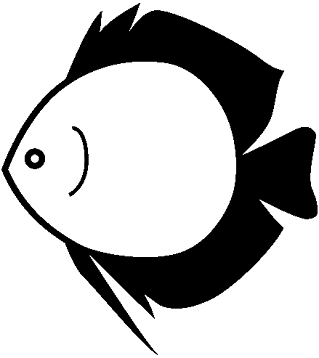 Glass Studio and Hotshop (located across the alleyway from the Morean Art Center) is a store and glass forge where artists can create glass artwork and demonstrate their craft. 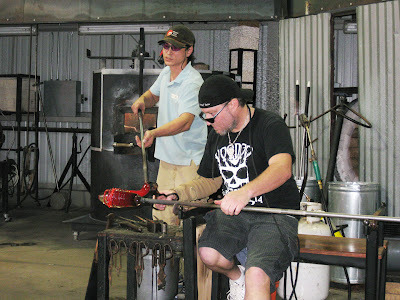 The Hotshop also offers glass blowing courses. 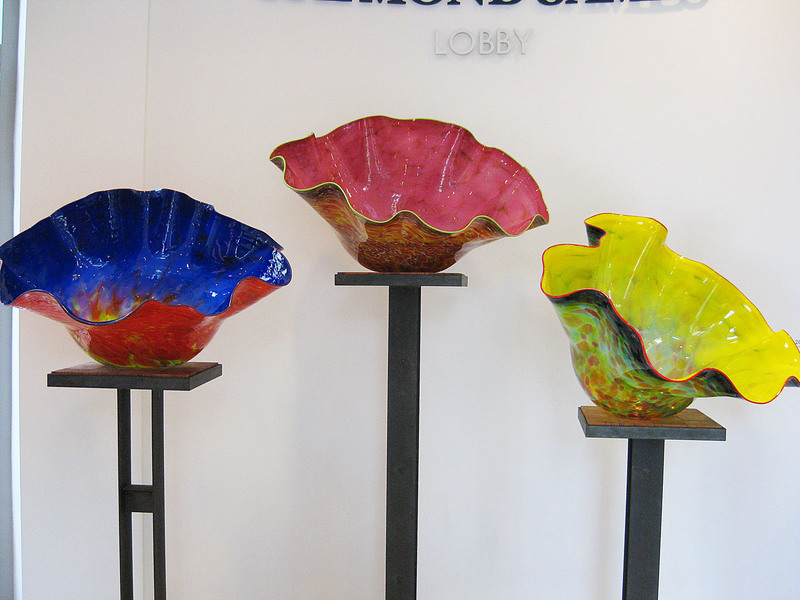 The Center for Clay (420 22nd Street South) is a center for ceramic education, offering ceramic courses for people of all ages. 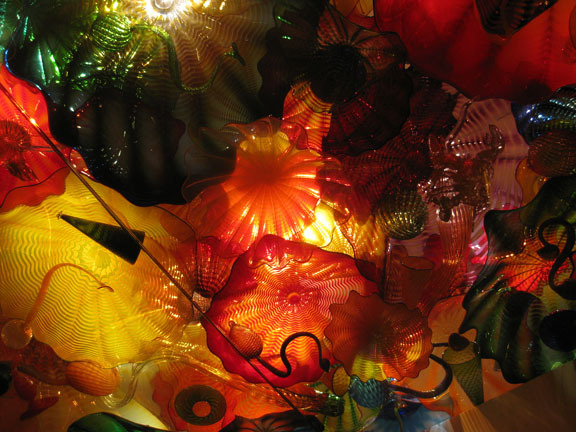 Chihuly Collection Gallery (400 Beach Drive NE), opened in 2010, is a 10,000 square foot building that was specially designed to house the works of the famous Seattle glass artist, Dale Chihuly. 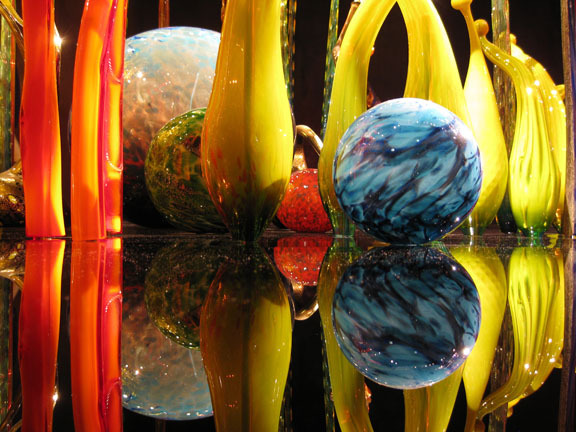 We purchased a combo ticket from the Morean Art Gallery that included the glass blowing demonstration at the Hotshop, and entry into the Chihuly Museum. 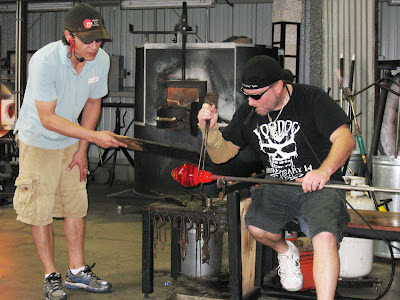 Since we didn't have time to visit the Center for Clay, we plan to visit again and sign up for some courses. 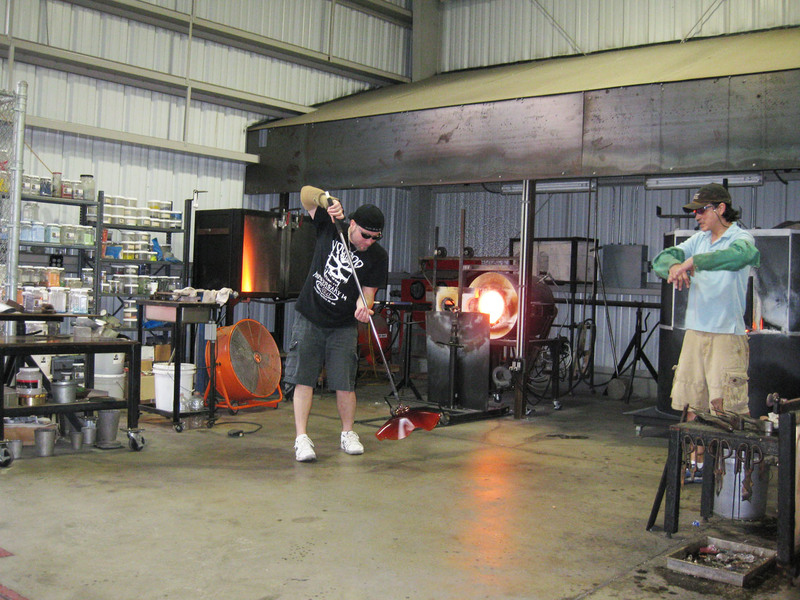 The Hotshop Glass Studio is a large, semi-outdoor workspace that has two walls made of chain link fence that allows natural ventilation. 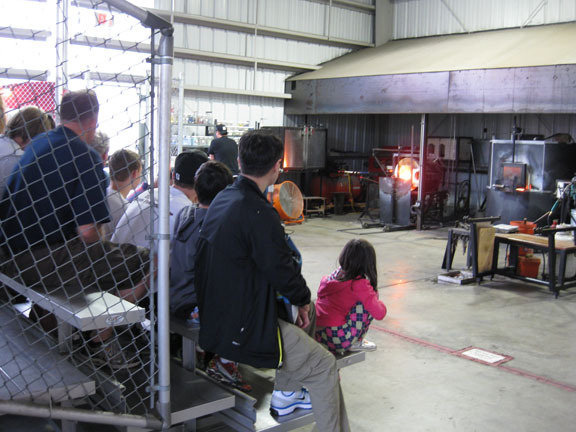 The forges are on one side of the room and seating on the other. Although the forge is over 20 feet away, when the forge doors open, you can feel and hear the flames. The sound is very much like the roar of the Balrog in the movie the Fellowship of the Ring. The demo has an artist and a speaker/assistant who explains what the artist is doing. 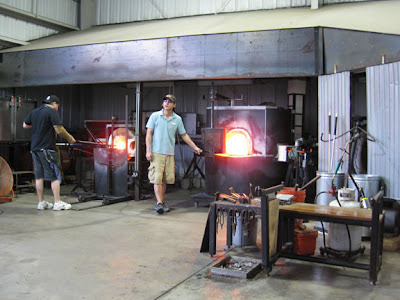 The forge on the left heats the glass. The forge on the right contains liquid clear glass. At first we thought he was making a vase but the final piece was a wavy plate. The Glass Studio store is housed in the same building as the Hotshop. 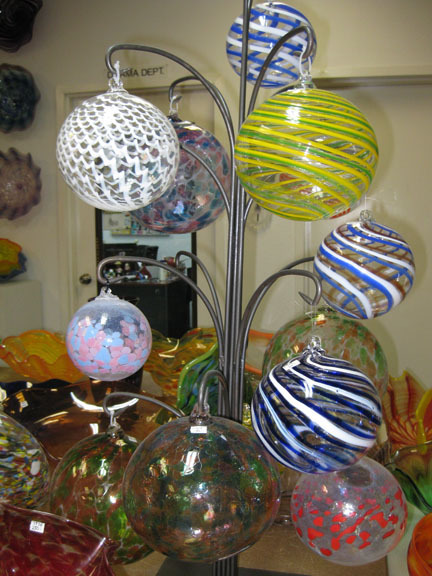 It displays a large collection of glass art created by both local students and professional glass artists. 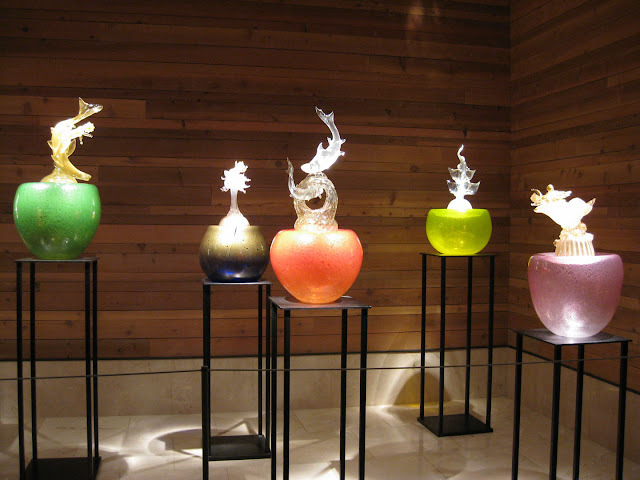 I was impressed with the variety and quality of the glass artwork. 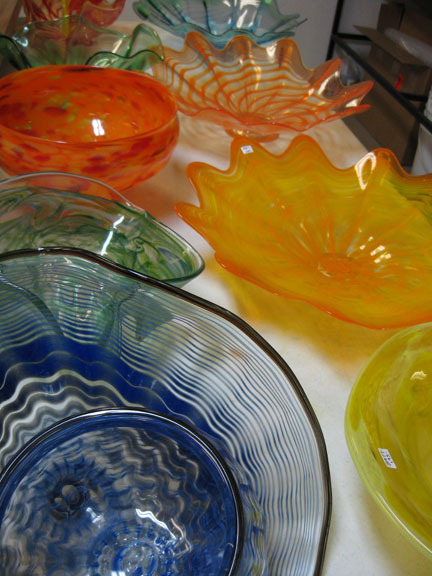 The price range was just a couple of dollars to thousands. 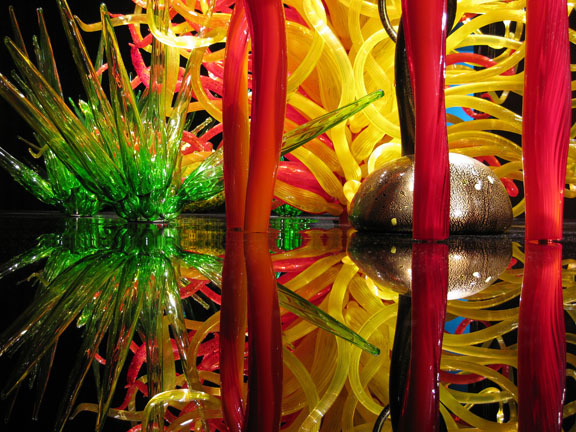 In the early 80's, I saw a sample Chihuly's work at a temporary display at Seattle's Pike Place Market. It was a blood red vase and was for sale for $700. 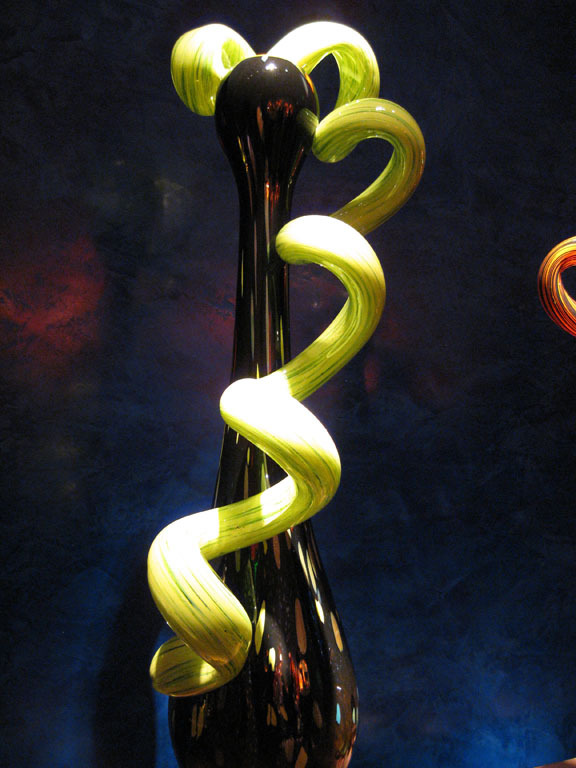 I was neither familiar with the artist nor formerly introduced to glass art, but that vase was stunningly beautiful. 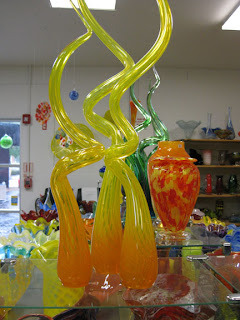 I would have purchased it if I had $700! 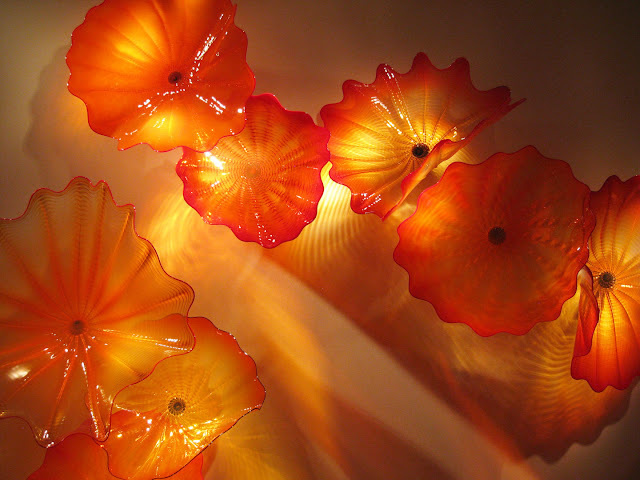 I was a poor student at the time and couldn't afford such luxuries. I still wonder how much that vase would be worth today. 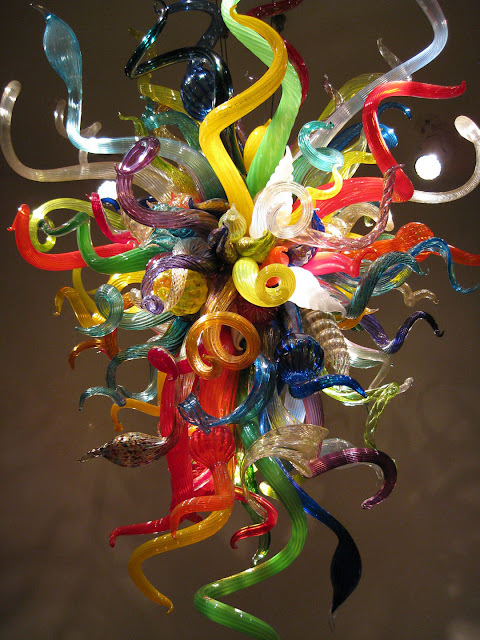 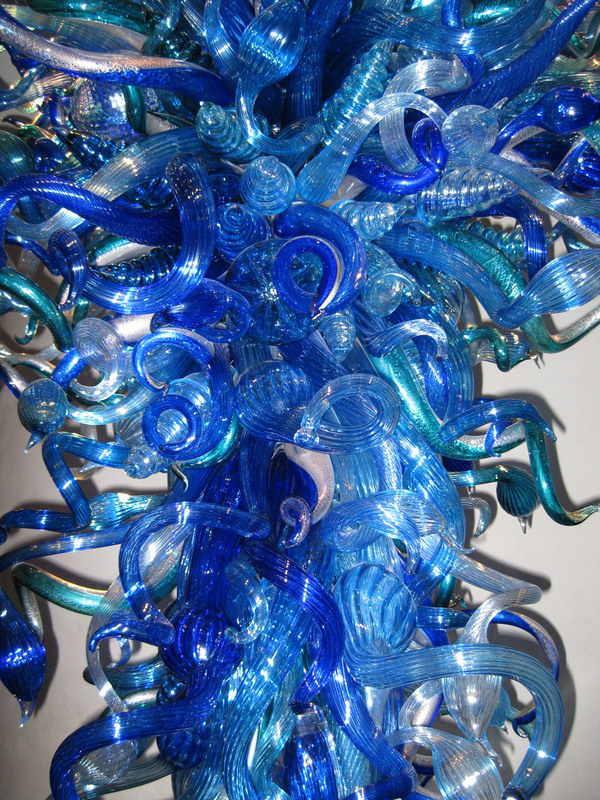 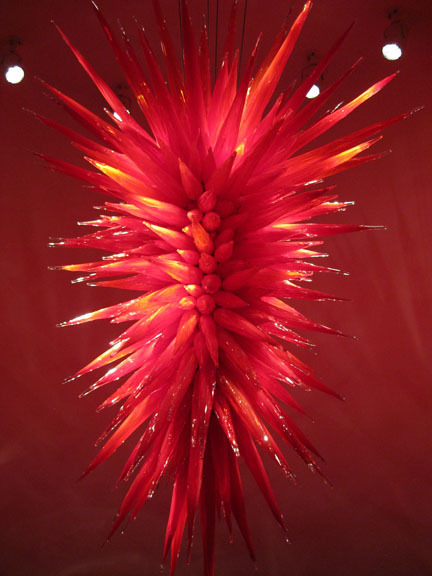 Dale Chihuly is the most renowned glass artist in the United States. 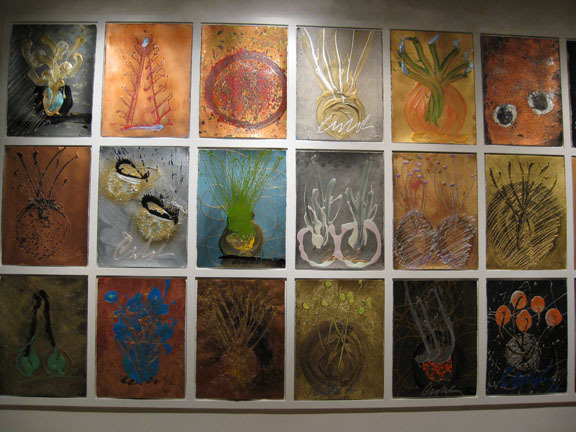 His work has been exhibited all over the world in major museums and galleries, such at the New York Botanical Garden, the Victoria and Albert Museum in England, Ukai Museum in Japan, de Young Museum in San Francisco, Musée des Arts Décoratifs in Paris, and the Tower of David Museum in Israel. 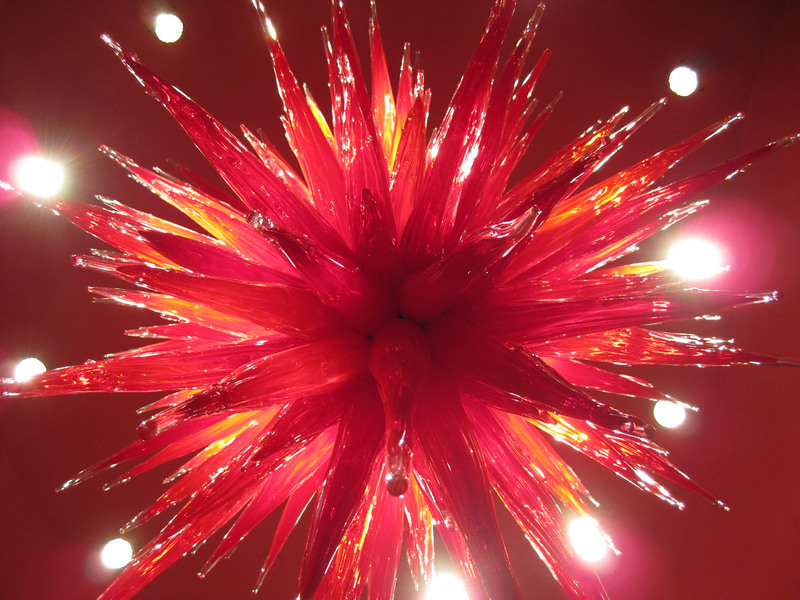 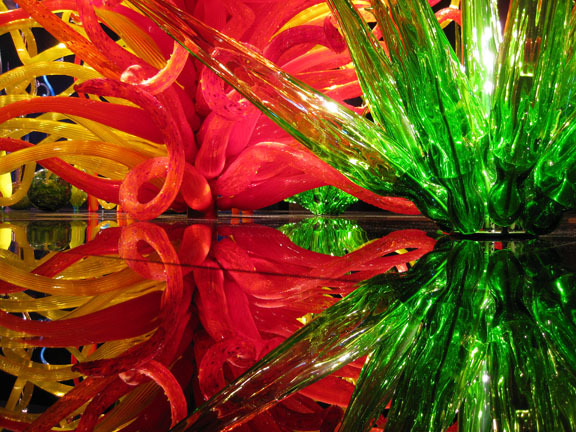 Chihuly's pubic glass installations are dramatic, colorful, organic, and HUGE. His chandeliers are from floor to ceiling as he believes that they should be seen at eye level. 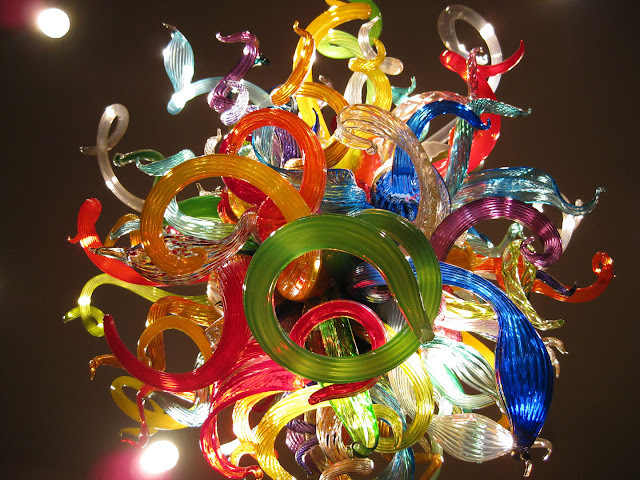 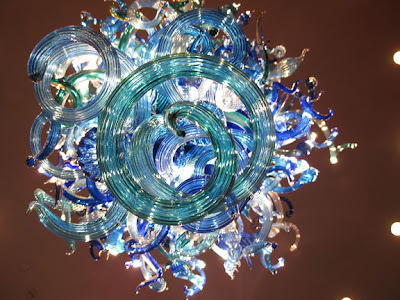 One of the largest chandeliers is at the Oklahoma City Museum of Art and is 55 feet tall! He is considered a pioneer in the studio art movement where crafts, such as glass and ceramics are developed in a small independent studio. 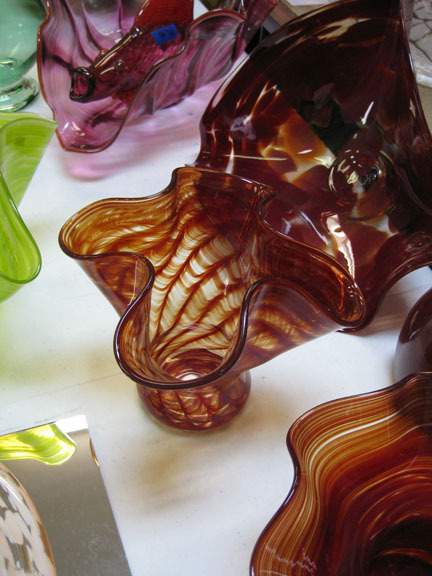 In this non-industrial environment, glass craft was elevated from the functional arena to the realm of art. 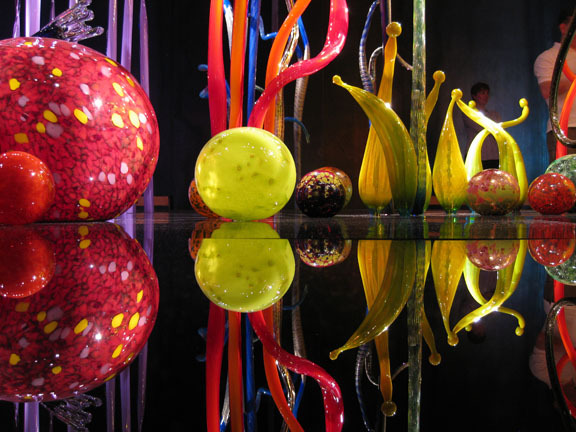 The board and supporters of the Morean Art Gallery decided to bring a permanent Chihuly exhibit to enrich the community both economically as well as culturally, and to provide a constant source of funding for the gallery's community programs. 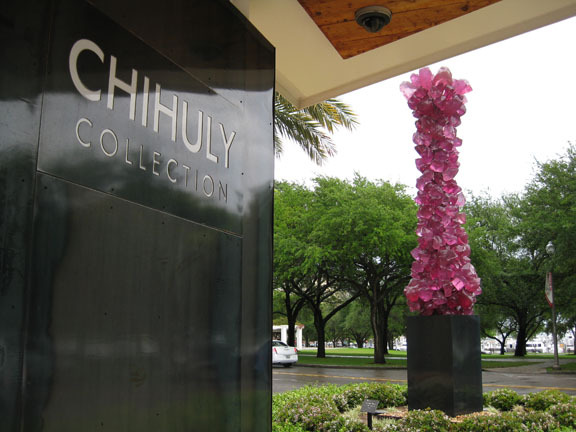 The Chihuly Collection own pieces from a wide range of Chihuly's major glass series, such as the Chandeliers, Macchia, Ikebana, Niijima Floats, Persians, and Mille Flori. Mille Flori means "thousands of flowers" in Italian. 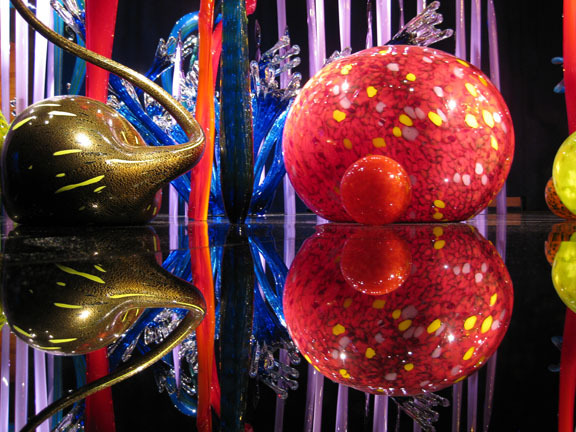 The organic-shaped pieces are placed on a raised oval black platform that has a mirror-like surface. 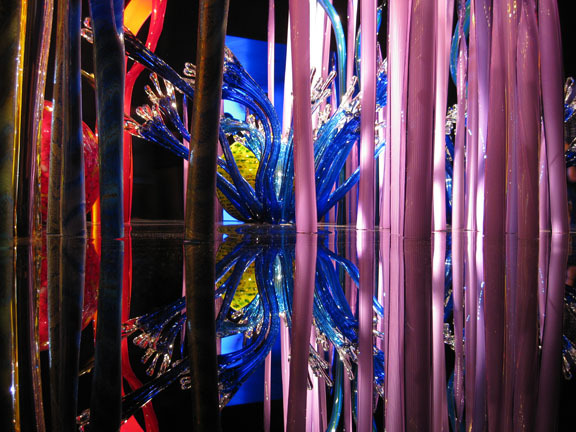 The color, shapes, and unworldliness of this installation transposes the viewer to an imaginary alien landscape. Seeing Chihuly's Chandeliers up close is truly an awesome experience. The gallery allows an uninhibited 360-degree view of the three Chandeliers. 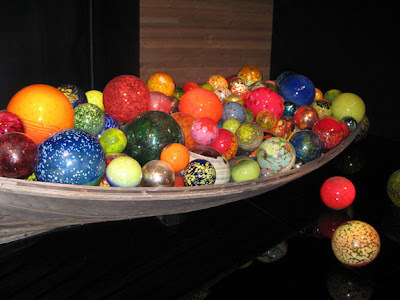 The only pieces that were cordoned off were the Sealife Stoppers which is a traveling exhibit, and the Venetians. If you are in Florida, take a side trip to St. Petersburgh to see the Chihuly Collection and the work of local glass artists. 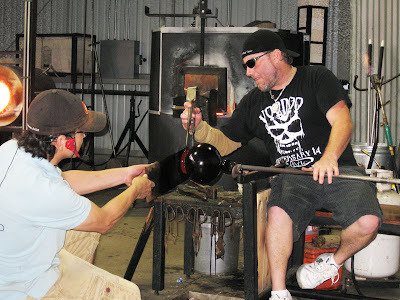 If you have time, take a glass blowing or ceramics course. Dry lips? 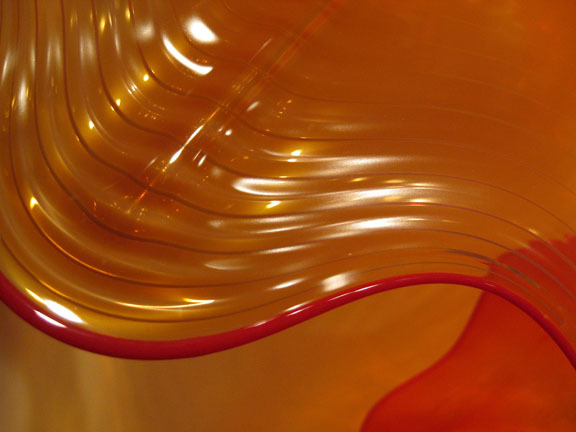 Sore joints and muscles? 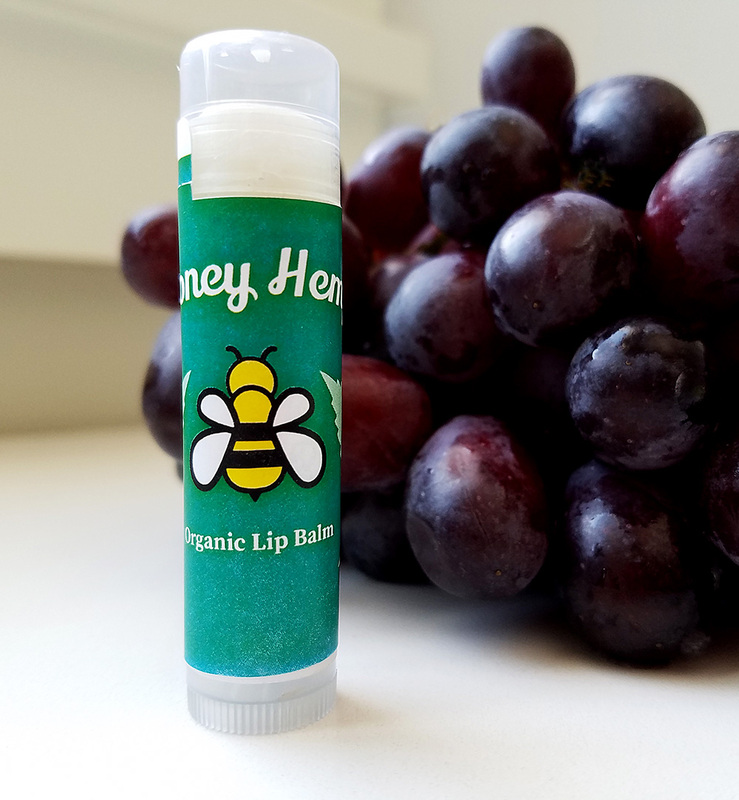 Try my Anti-Inflammatory Lip Balm!